A little bit of info about WWII fashion and rationing. Whilst food rationing had been in place since 1940, the imposition of clothing rationing was not announced until 1 June 1941. With Great Britain effectively cut off from all supplies from Europe and a greatly diminished supply route from the USA, rationing sought to ensure a more equal distribution of what was available. Each kind of clothing was allocated a 'points' value, which was based on how much fabric it took to make and how much labour went into its manufacture. For example, a wool dress took 11 coupons compared to 2 for a pair of stockings or 8 for a pair of men's trousers. Each adult had an allowance of 66 points to last a year, but as war production increased in the run up to D Day, the allocation shrank to just 24 during 1945-6. Customers had to plan how they would use their points very carefully, and the government constantly reminded the population of the complex and difficult choices they had to make to make their clothes last. Of course, the customer still had to pay for the garment as usual, but every type of clothing had the same points value regardless of the quality of the garment. So, a coat of cheap fabric would cost the same number of points as a robust coat which would last a lot longer. Wealthier customers were therefore better served by the rationing system, especially considering clothing prices were generally higher during the war due to the shortage of fabric and materials being commandeered for the war effort. To try and combat these problems the government introduced the Utility Scheme also on June 1st 1941, to ensure that low and medium quality consumer goods were produced to high standards at reasonable prices. 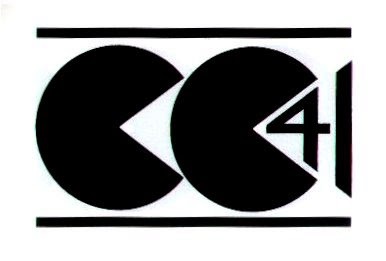 Clothes made under the scheme were identified by the CC41 label an abbreviation of Civilian Clothing 1941 (the holy grail to vintage collectors!). They were made with fabric that had a set specification of weight and weave called Utility Cloth. As well as rationing the number of clothes people could buy, the actual designs of garments were governed by strict rules. The Making of Civilian Clothing (restriction orders) was passed in 1942; this forbade the wasteful cutting of clothes and set strictly enforced limits that tailors, dressmakers and home sewers, had to abide by. The restrictions were extensive for example, a dress could have no more than 2 pockets, 5 buttons, 6 seams in the skirt and only 2 inverted or box pleats, or 4 knife pleats. No unnecessary ornamentation or decoration was allowed. Collection of the V & A. To demonstrate that these limitations were not an end of style and fashion, the Board of Trade employed a group of London's top fashion designers, including Hardy Amies and Royal favorite Norman Hartnell, to create a year round collection. The Incorporated Society of London Fashion Designers or Inc.Soc as they became known was founded in Jan 1942. They produced designs that could be made with a limited amount of fabric e.g. 1.8 metres for a dress, which resulted in an emphasis on line and cut and also reduced the cost. Whilst government standardised fashion had not been seen as a good idea by many, the fashion press appreciated the new collection of attractive, affordable clothes. British Vogue praised them for being elegant, simple designs that were eminently wearable - 'All women have the equal chance to buy beautifully designed clothes suitable to their lives and incomes'. An example of Inc Soc design can be seen in the beautifully tailored suit pictured above from the V&A's collection. It was probably designed by Elspeth Champcomunal in 1942 (Inc Soc designers were not always given direct credit, to prevent favouratism). 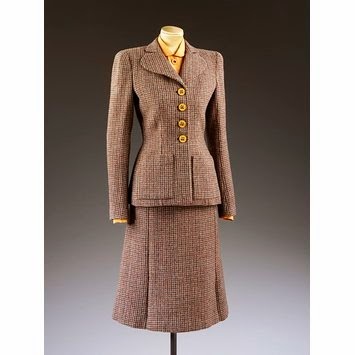 It exemplifies the tailored, slim line silhouette, with pronounced shoulders and a nipped in waist (reminiscent of the uniforms worn by the forces) that became the standard wartime look. 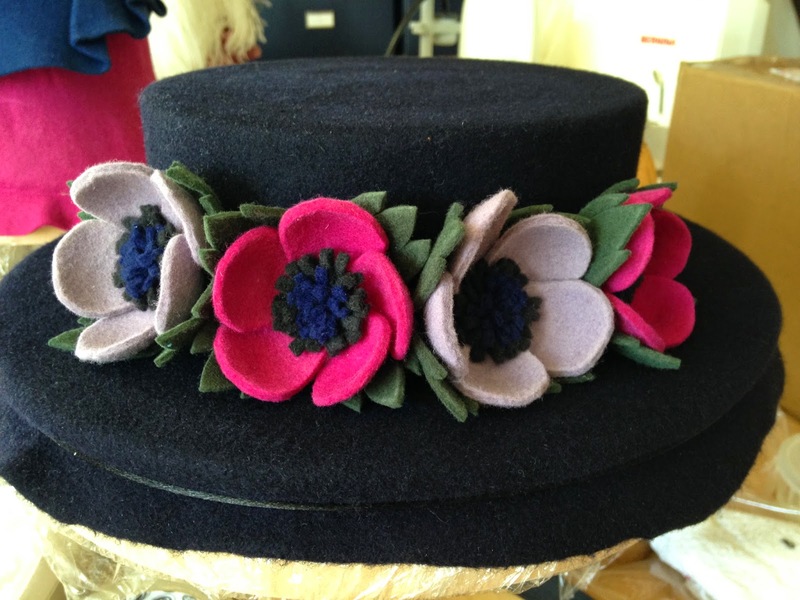 It is also beautifully made and finished from a hard wearing woolen tweed. The scheme proved to be extremely successful, by the end of the war about 85% of all civilian clothing and fabric bore the utility label. Perhaps the most famous response to the rationing of clothing was the Make do and Mend campaign. 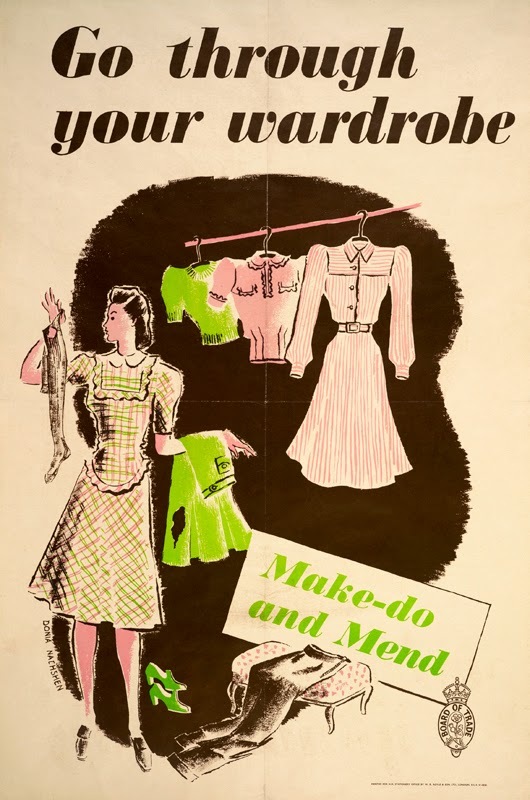 The campaign 'was not merely designed to revive the lost arts of darning and patching, but to raise morale by showing how old clothes can be turned into really smart and attractive new ones' Posters and leaflets, such as the one pictured, encouraged women to go through their old clothes (and their husbands old clothes) and repurpose them for themselves and their children. Another important facet of the campaign was teaching people to care for and repair clothes they already owned to make them last longer and preserve the precious coupons. Women became ever more imaginative and creative in recycling, and renovating old clothes and creating stylish, home made accessories. The government was genuinely concerned with maintaining the morale of the public, particularly women who were vital for the war effort. By 1945 2.2 million women were working in war industries, building everything from ships to aircraft. Maintaining their personal appearance was vital to keep morale on the home front high. Ok, so that's quite a lot of background info on rationing! As you can tell I find this period of fashion history somewhat fascinating. I have always been in awe of the women of this period such as my Nan, who maintained their own style with such creativity and ingenuity. I wanted to make something that one of them might have actually made and worn so decided to use an actual pattern that was available during in 1942. 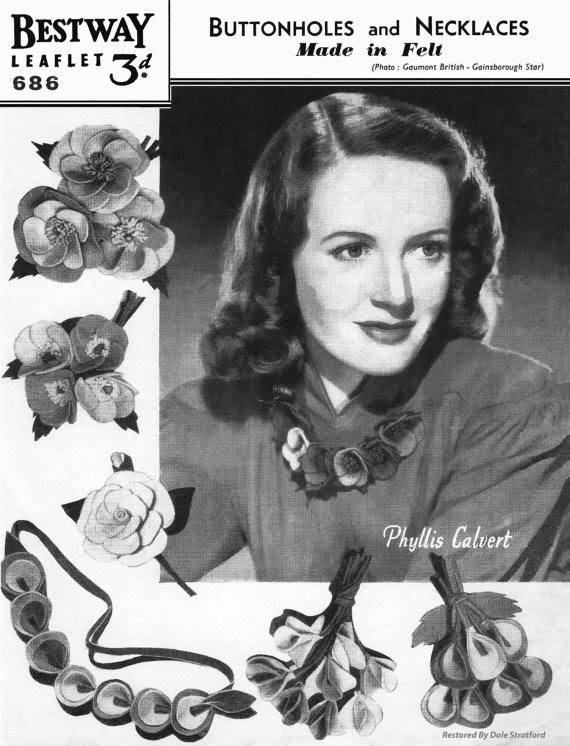 I first saw the pattern (pictured left) in one of my many costume history books -The 1940's Lookbook by Mike Brown. As with so many period publications you can now find a copy of the original online. This pattern is available to download from Etsy here for the bargain price of £2.08. 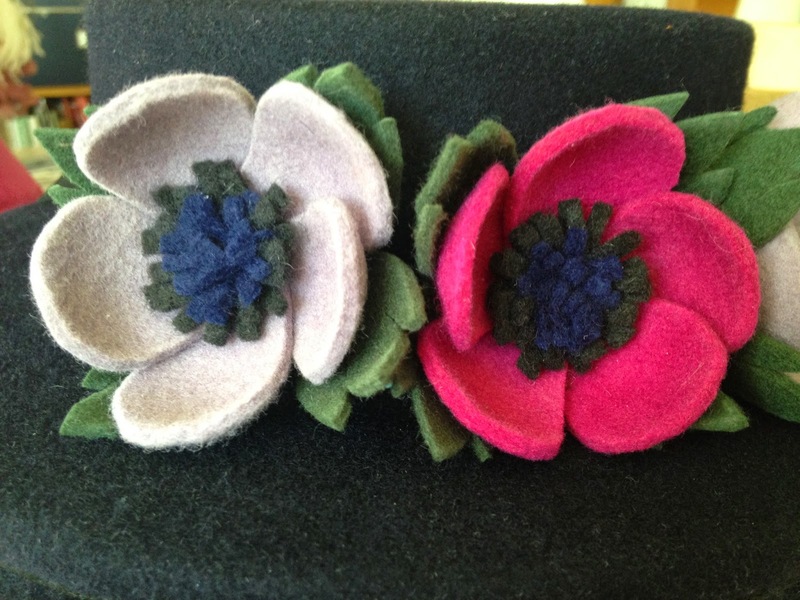 It's really very simple to follow and I made mine entirely from scraps of felt I had left over from my hat making, so definitely coupon friendly! 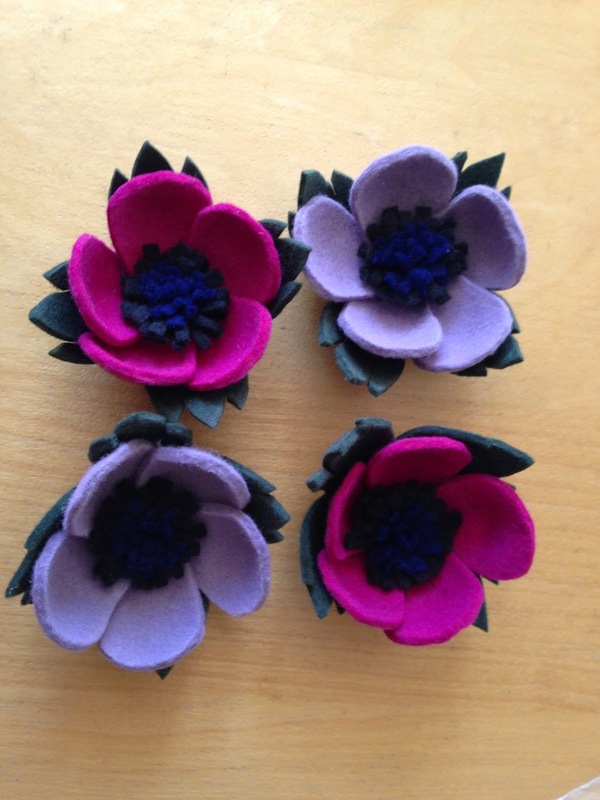 I'm not quite sure exactly what I am going to use them for, possibly a brooch as suggested in the pattern, but I rather like them on the boater I used as a background in the pictures. Either way I am very pleased with how they turned out and will definitely be making some more.